since "chacarron" remains stuck in my head and continues to amuse friends, i've been trying to learn more about this mysterious macarena-of-the-internets. for one thing, led astray by wikipedia (you don't say? ), i think i jumped the gun in identifying "chacarron" as the creation of a satirical mexican band named el mudo. indeed, the video identifies the artist as "andy's val gourmet" - a seeming cipher of a name, the googling of which turns up but mirror-upon-mirror of that viral video. and other murmurings (mumblings?) on the webbywebs seem to corroborate the name, if affirming the various variations on it: "andy val gourmet," "andy val's gourmet," and "andy bal gourmet," among others. who is that dark-glassed man? this picture of a record pressing provides a little more information and a little more mystery, attributing the tune to three practically ingooglable writers - rodney clark donalds, andres henry de la cruz, and wilfred sanchez. another vendor confirms the ministry of sound connection (and, of course, there's some white label action, er, to boot), which, in turn, links the song to el chombo ("feat. andy's val gourmet"), which makes sense since a guy named rodney s. clark seems to be sr.chombo himself. 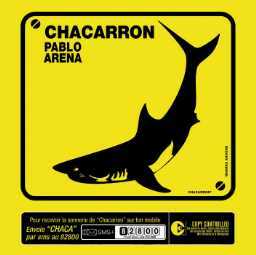 but then, oddly enough, there's no sign of "chacarron" over at el chombo's site (which does, however, offer up some wicked mp3s, esp for those who haven't heard anything from panama since el general). . . . or is there? another amusing tidbit is that the song is apparently being sold, in some cases, along with an english (mis)translation, as "shark around" (was it a borracho transliteration to begin with? ), a title endorsing the suggestive make-your-own-meaning mumbling that animates the track. doesn't that make andy's val gourmet, like, the sigur ros of latin america? so, yeah, then there's this "pablo arena" dude (on EMI-france, no less), who also appears to have recorded a version (available via denmark?) as well as a ringtone of the thing (being sold from norway?). doesn't that make "chacarron," like, the "whoot/mp (there it is)" of 2004/5/6/7? depending how much "chacarron" continues to catch on and whether a panamanian ends up on the tag team end-of-the-stick, this could presage a return of panamanian reggae to the world club/youtube scene, to coin a phrase. i know that's a little like saying weird al was an emissary for polka, but he sorta was. 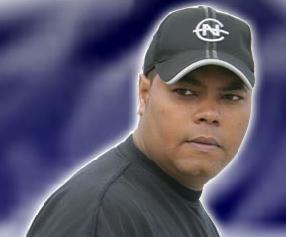 Después de haber gozado en los carnavales con las poncheras de El Maestro Andy's Val nos llego un niño de solo 3 años de edad apodado Andy's Bals Jr. que ha revolucionado las masas y por supuesto sus fans #1 los niños con su tema chakarroncito muy sonado en las diferentes Emisoras de Panamá. Andy Jr. nos manifestó a través de su representante que estará con nuevos temas, entre estos nos soltaron una plena que dice (Verduras, verduras 3 por un cuara) una ponchera así. Todo esto vendrá incluido en la producción de Andy Vals y sus Amigos. Comenzó temprano su carrera este pequeñin made in Panama. i'm not sure who the kid is, or whether the recording is actually panamanian, or who this andy bal/val guy is, but i think i might like "chacarroncito" even more than "chacarron." and i'm told on good authority - none of that internet crap - that twelve-year-olds and three-year-olds absolutely adore it. pues, por supuesto. ¿y tu? 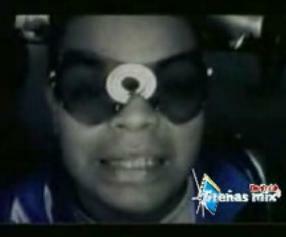 andy's bal jr., "el chacarroncito"
A merengue version is very popular in the Dominican Republic by merengue star Tulile. thanks, alberto. i've heard of the merengue version, but i haven't heard it yet. i'll have to try to track it down. dit you heard this one ? and there's a post-colonial caribbean connection here, too, of course. according to this search, the cover was inspired by hearing the original in curacao: "mijn collega dave kwam terug van curacoa met een zeer geestig aanstekelijk liedje, chacaron." also, the version i downloaded has three minutes of silence afterwards. weird. this song just keeps going and going and going. mas chacarron! I just realized that Comando Tiburon (Chacarron) music was copyed form Kurtis Blow !! of course, it's only one section of the song that uses the kurtis blow break. i like how his flow changes accordingly, aping a kind of old school rap style. interesting details, latinbrother. thanks for sharing. do you have either of these DJ Saidd versions? or do you have contact info for him? i'm still trying to get to the bottom of this complex story.